The District has both analog and automated metering infrastructure (AMI) styles of meters. Water meters are inside a rectangular plastic, concrete or steel boxes, flush with the ground, and are usually located near a roadway curb or sidewalk near the residence’s property line. Be careful when opening the lid as there may be spiders, snakes, scorpions, bees or other bugs inside. Your analog meter has a display like an automobile odometer. Read all digits except for the two on the right. This meter reads 2536 hundred cubic feet (HCF). Each HCF equals 748 gallons. 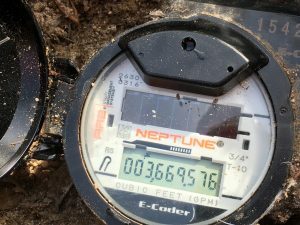 Your meter is read and you are billed in hundreds of cubic feet, however, the usage on your bill has been converted to gallons, too. If the last reading was 2510, your usage would be calculated as follows: 2536 – 2510 = 26 HCF, or 26 x 748 = 19,448 gallons. Below is a picture of an AMI register. Read the first four digits from the left. This meter reads 0036, which is 36 hundred cubic feet (HCF). Each HCF equals 748 gallons. Your meter is read and you are billed in HCF, however, the usage on your bill has been converted to gallons, too. If the last reading was 30, your usage would be calculated as follows: 36- 30 = 6 HCF, or 6 x 748 = 4,488 gallons.